Discussion in 'Holden Commodore How-To's' started by EYY, Feb 28, 2017. HQ-HZ BF/FG conversion --> Post 63, P4. Lately I've found that my car isn't staying as cool as I'd like it to in warmer (30+ degree weather) when the aircon's on and sitting in traffic. The old clutch fan works extremely well, but at idle, it's just not pulling enough air through. Without the air-con going it’ll happily sit on 82 degrees all day in almost any scenario. It's certainly not a necessity, but I feel that it'll prove to be an improvement over the factory setup for stop-start driving. 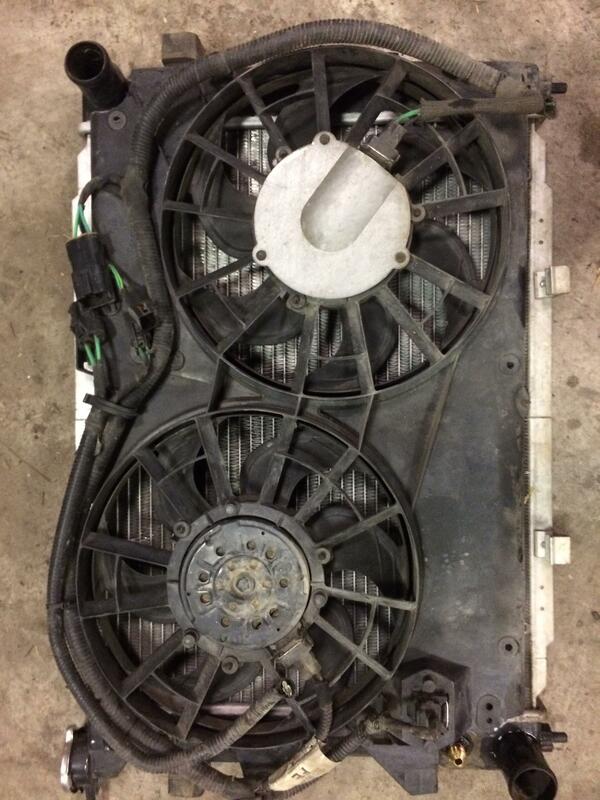 I've decided to fit thermo fans off a 1998 Ford Mondeo. Apparently they're the same as AU/BA fans but just with a slightly smaller shroud, which suits the design of the VN-VS radiators much better. I investigated the EL fans, and actually have a set here - and while they would work, the fans interfere with the trans cooler fittings in the radiator, and the shroud was too big to fit nicely in between the charcoal canister on the driver’s side and the air con lines on the passenger side without some butchery. Apparently the AU's fit, but there are still a few 'modifications' required before they fit properly. -Wire – From what I can gather, the minimum size you want to run to each fan is 25a. The main earth and power wires I used are quite large, I’m not sure of the rating but they’re a little smaller than 8 gauge. -Fuses – you’ll need one fuse for each fan – fuses need to be matched to the amperage rating of the wire. I’m using twin 25a fuses. The Mondeo's almost fit perfectly without any trimming as you can see below - and they even bolt straight to my radiator after I’ve drilled a few holes (just need to make one small bracket for one the corner near the filler neck). I used a holesaw and an angle grinder to shape the shroud to clear the trans cooler fittings and radiator inlet/outlet nicely too. There's a bit of uncovered radiator below the fans which I'll eventually cover up with an extension to the shroud. 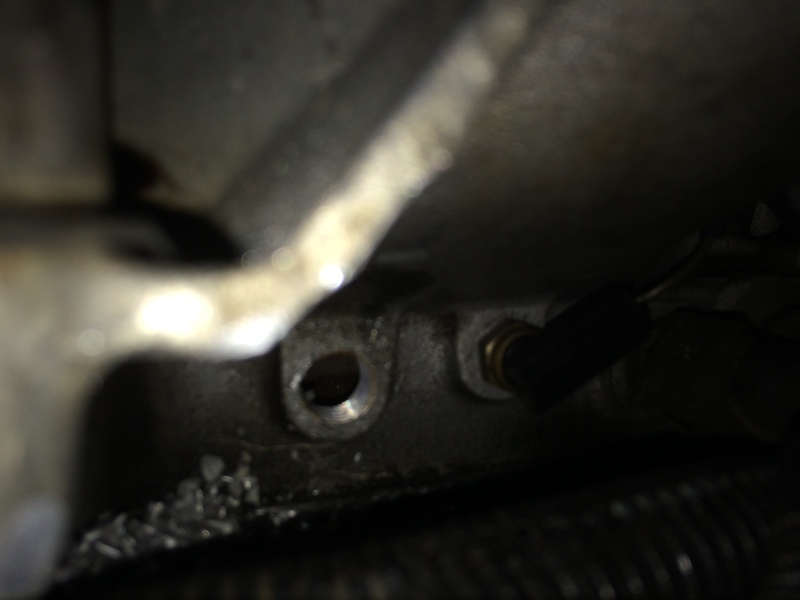 Keep in mind that you’ll need to replace the water pump bolts with shorter ones if you're removing the clutch fan too. I’ll update with pics once I have them mounted and running. Some high density foam between the shroud and the radiator at the top and bottom is a good idea to ensure that the fans are sucking air through the radiator, and not through the gaps (air will take the path of least resistance). Here you can decide on whether or not you actually want to utilise the two speeds or not. VN-VS V8’s have the capability to trigger a thermo fan from the factory. In most of the older ECU’s the tune has the trigger set to turn the condenser fan on at 106 degrees OR when the A/C is running. This is much too high to use as a trigger for thermo’s. The easiest way to get around this problem is to have the tune altered to bring the thermos on at 95 degrees and off at 90 or so (depending on your thermostat temp). In my case, I was lucky enough to find that the VS S3 sequential ECU with cpnd tune already has the temperature set suitably from the factory. Mine turns on at 95 degrees and off at 90 (using a 82 degree thermostat) which is perfect. Unfortunately the factory ECU only has the capability to control the cut in/out temps of one speed. So I overcame this problem by fitting another thermo fan switch in the manifold. And because the factory ECU fan output is triggered by both A/C and coolant temperature, I decided to use this as the low speed trigger. For the high speed trigger I used the Tridon TFS108 (on at 100, off at 95). Tridon have some good alternatives for different temperature ranges and also alternatives for switches that can provide both high and low signals; although those ones tend to be a little more on the expensive side. VN-VS 5L manifolds have an unused boss that can be drilled and tapped for the additional fan switch. I found it easy to do when the manifold was still on the car with the radiator removed (apologies for the poor lighting). 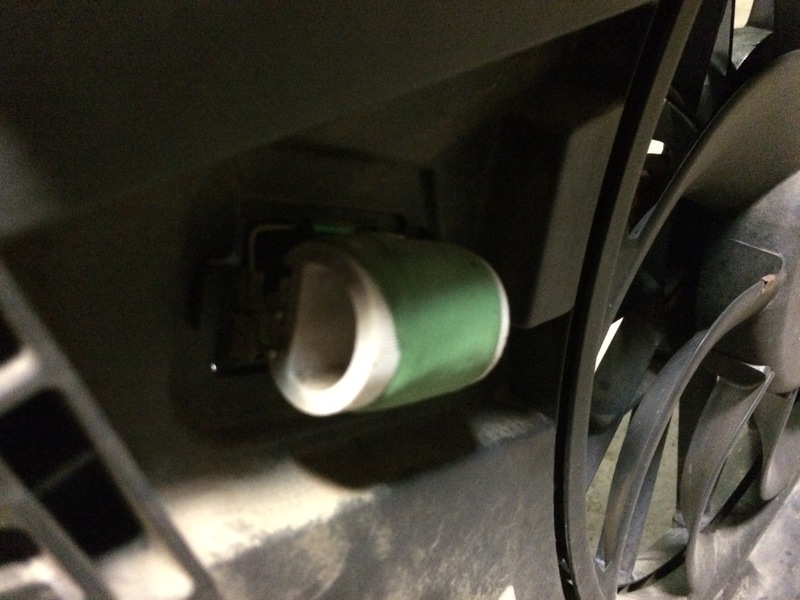 The reason I chose the twin thermos is because they're easy to wire for two speed operation. For low speed the fans are connected in series. For high speed, the fans are connected in parallel. 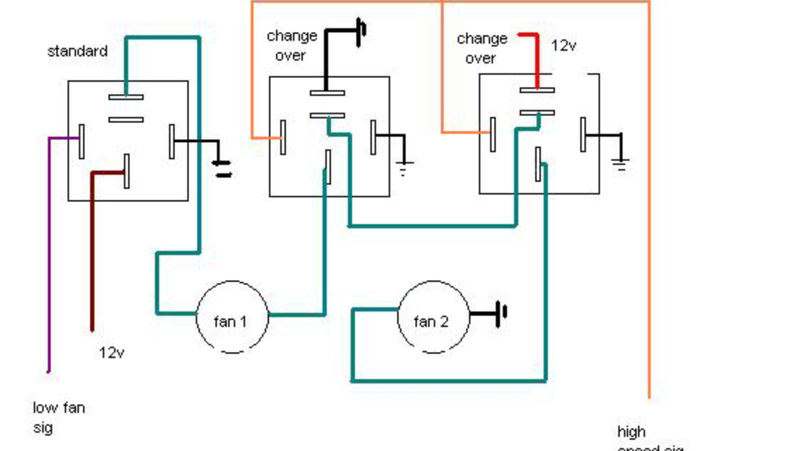 This is accomplished by using three relays (one standard and two changeover relays) as you can see in the diagram below. Credit to the original poster of the image. IF you decide to use the fans on high speed only with only one trigger, wire sizing and fuse ratings are especially important. On start-up these things draw an incredible amount of current. I’ve read cases where people have tried using circuit breakers instead of fuses to avoid replacing fuses. 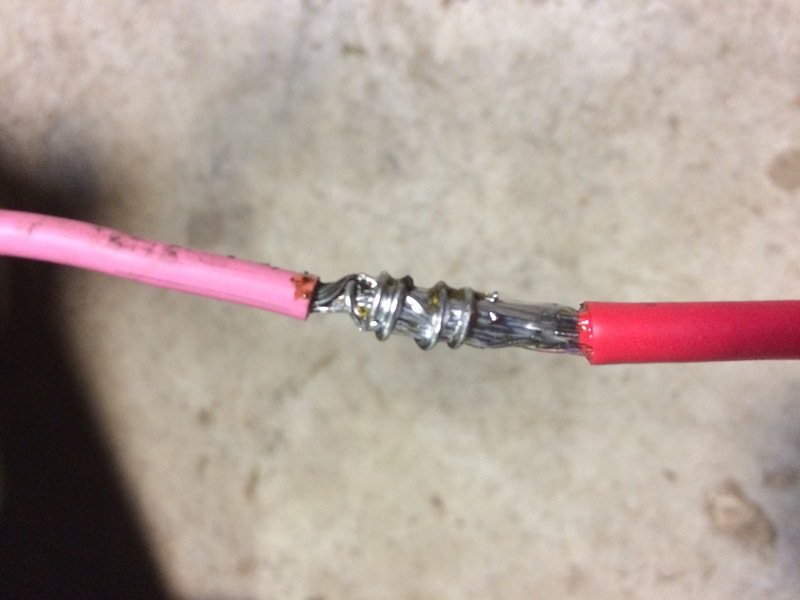 Using wiring and fuses of the correct rating should avoid any problems like this. 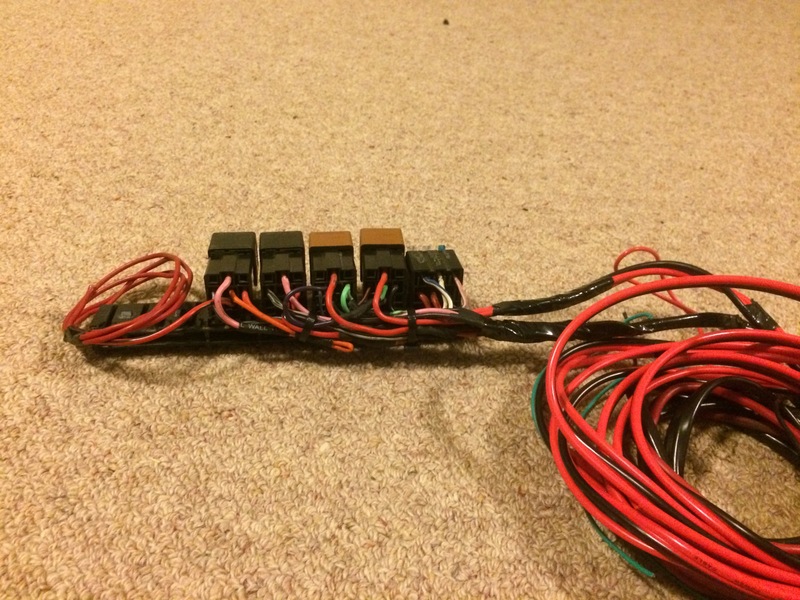 *Disregard the extra relay on the end, it’s for a set of driving lights. 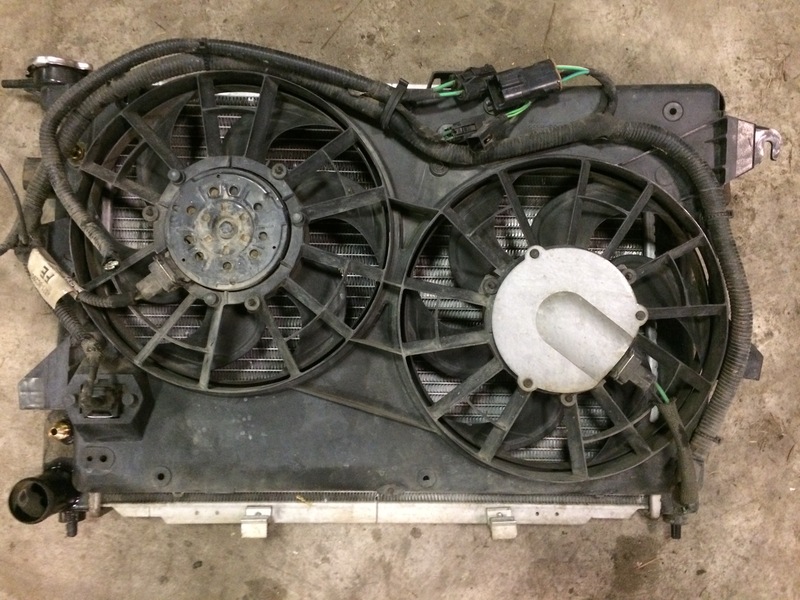 I though it'd be worth doing a writeup on the Mondeo's being fitted to work with aircon, the factory trans cooler and with high/low fan speeds, so hopefully it's able to help someone. I just need to find a couple of hours to finish fitting the fans and i'll update the thread with more pictures and info. Feel free to add any info or make any suggestions! Commo74, woteva and Sandman like this. This part was the most difficult as I wasn't sure exactly what I needed. I found the original Bosch part number, but it's no longer available - I spent a long time calling different parts stores and even bosch themselves, which meant I needed to find an alternative. The difficult part is that the alternator shaft is very short compared to most others. This means that you need to use a cupped pulley so that you have enough thread to bolt the pulley on. 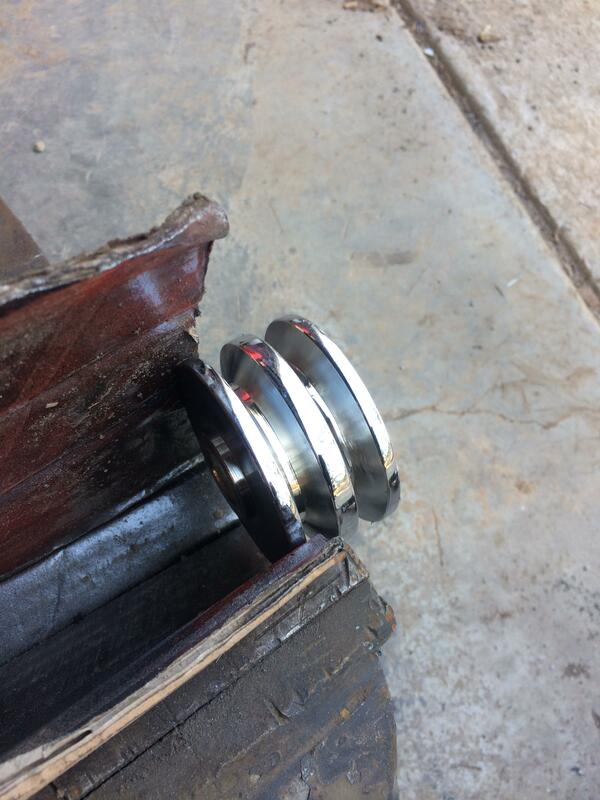 It's a double row pulley that bolts on in a similar way to the factory pulley. 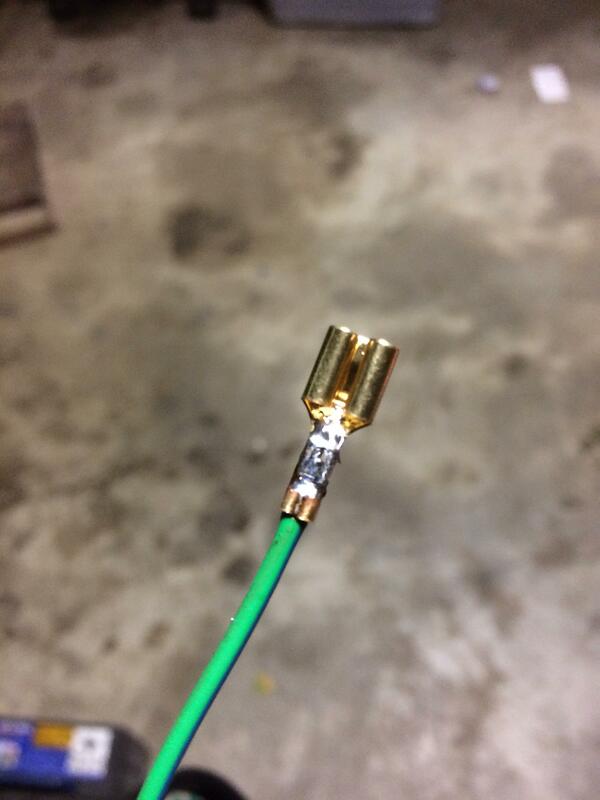 Be careful if you buy one, some share the same part number (TUF7610F) but have different diameters. I purchased the 2.625" pulley as it's the same diameter as the GM unit. This pulley slid on perfectly and the rear V section happened to sit in exactly the right spot. 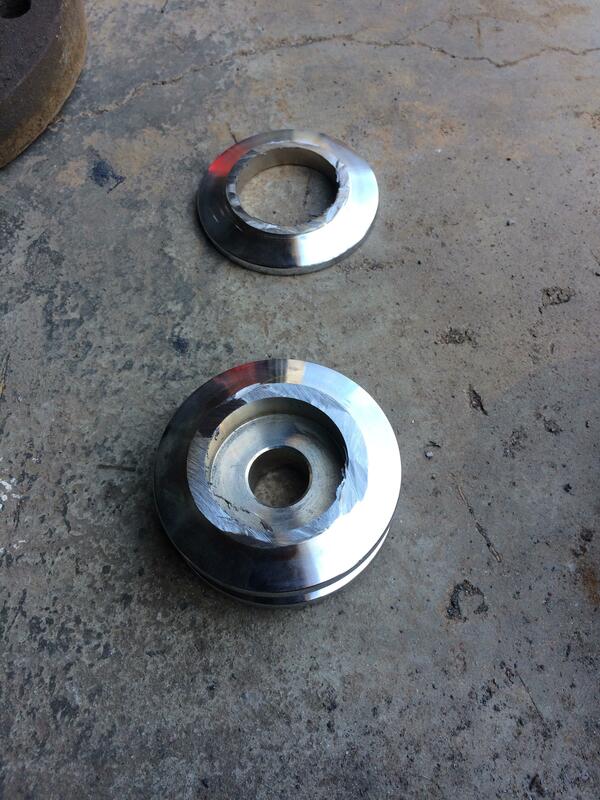 The only problem was that the shaft was still too short to tighten the nut. I needed to machine 8mm from the centre to leave enough thread to fasten the pulley. That's the hard bit, which doesn't actually end up being hard once you figure it out. 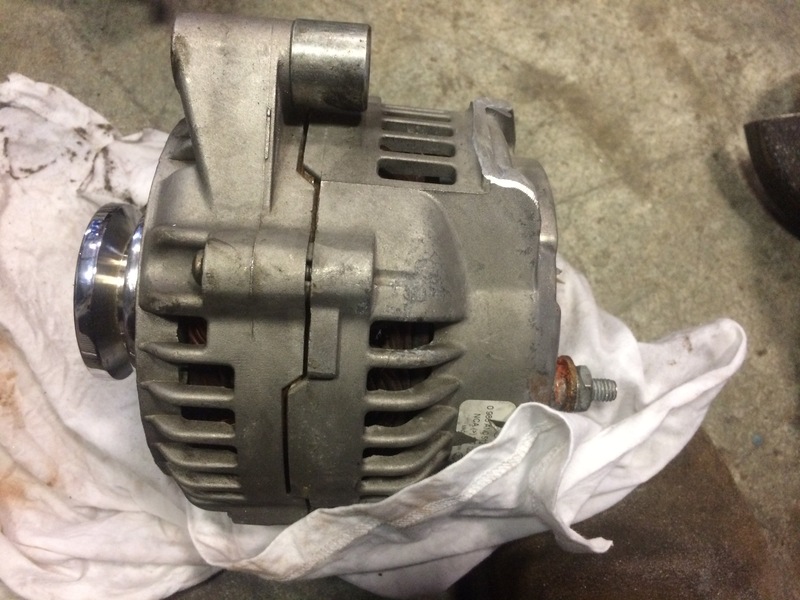 I wrapped the alternator with a damp rag before cutting the bracket off with an angle grinder. I wasn't too particular about it, I just needed to get it done before I found myself stranded again. Reinstall the regulator and you're good to go! It bolts up exactly the same as the old one. I noticed some mentioned clearance issues, but in my car clearance isn't a problem - even with an old (stretched) belt. The alternator isn't limited in adjustment at all. I suspect this may be a problem in earlier commodores and other conversions though. So the VT alternator is on and working extremely well - with thermo's, A/C, radio, wipers on high and headlights on high beam it doesn't drop below 13V at idle. This setup will be using a single speed, although the big single fan can be setup for two speeds if you desire. The BF fan is noticeably quieter than the twin fans - but I haven't fitted the single yet, just observed during some testing. I've purchased a second hand genuine fan and have chosen to run my own relay/fuses for this setup. 4) Fuseblock from another commodore - twin 30a fuses required (25a fuses aren't quite enough). 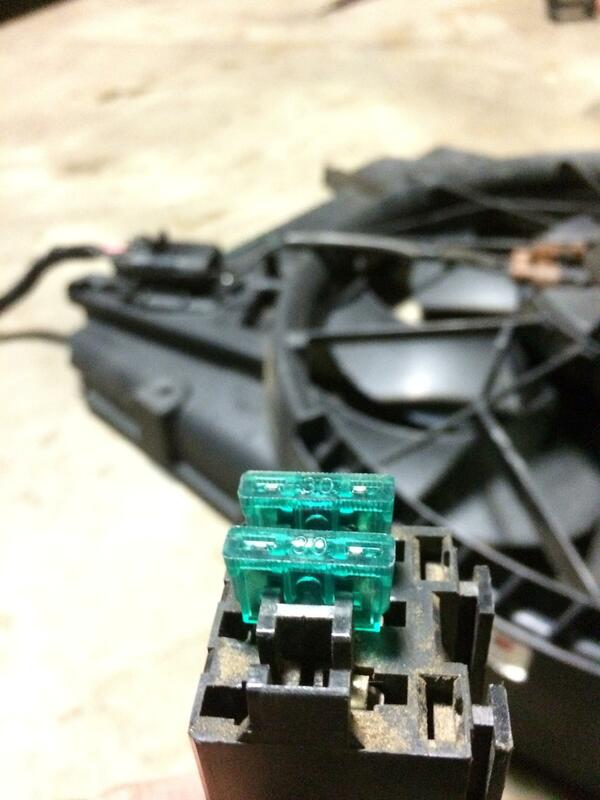 The wiring is very simple, positive goes from battery and is split to two fuses>Relay>Fan. 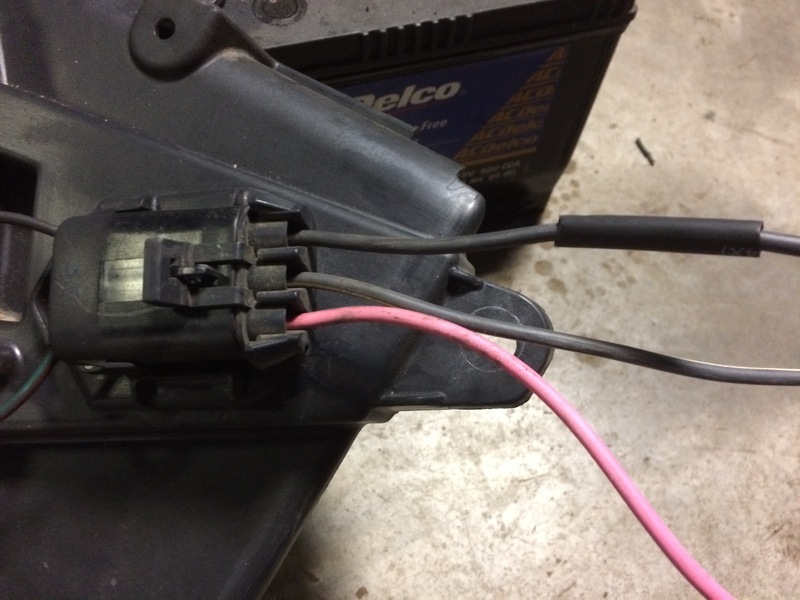 The negative for relay trigger and fan are attached to the body of the car just above the battery, and the positive side of the relay trigger is connected to the thermo fan output from the pcm. 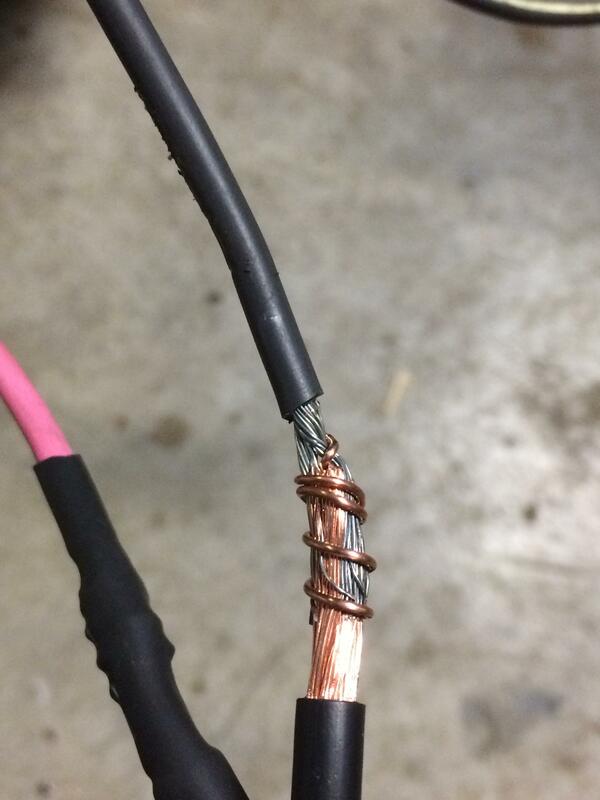 Pink wire is positive (high speed). 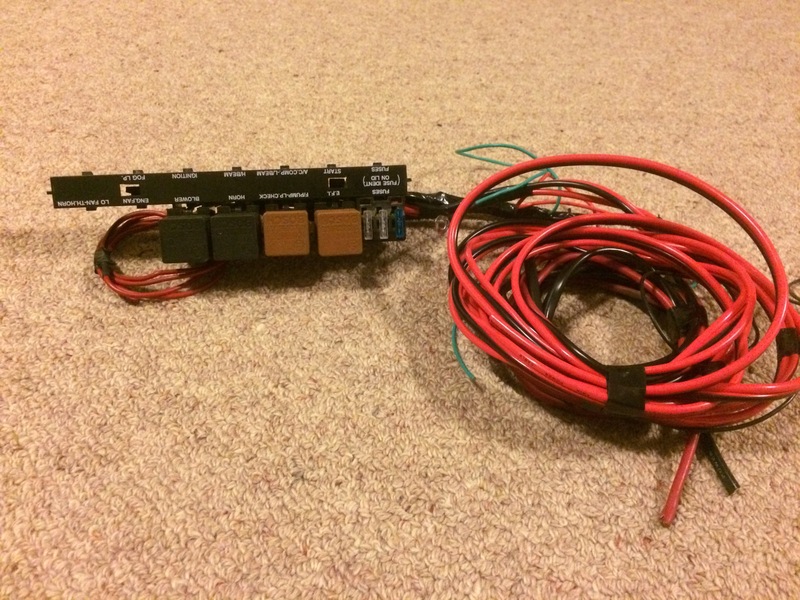 Middle wire is for the low speed and goes through the heat sensitive resistor (thermistor) which on the front of the fan housing - this is where you connect 12v for your low speed fan if desired. 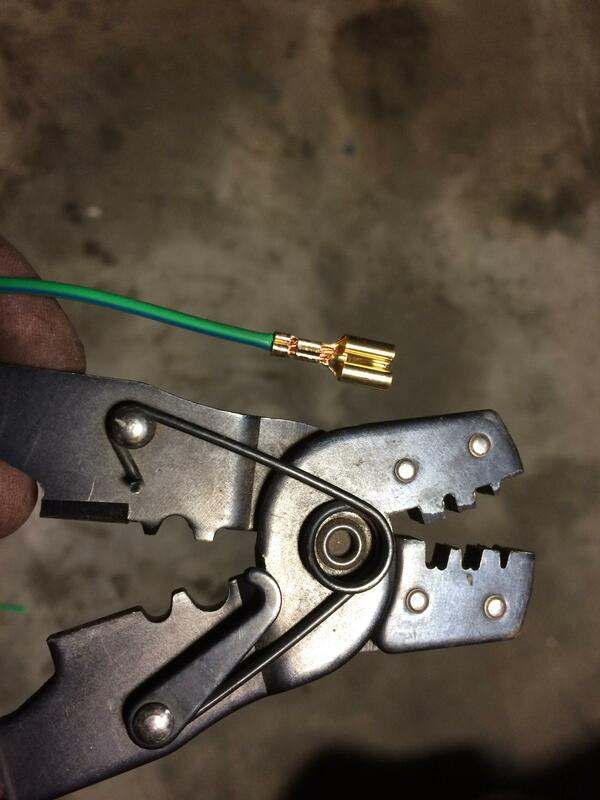 Crimping the connectors for the relay base - the right tools are a great investment. This one's from Jaycar and was under $20. I always solder them too. When joining wires I find that wrapping a few strands of heavier gauge wire around the join helps to keep things neat when soldering. It also helps to slide your heatshrink on easily and ensures it doesn't catch. I just need to fit some terminals for the battery positive and the earth, and it'll be ready to install. The fuses will be located in the fuse panel in a vacant slot, and the relay will be located just next to the fusible link box/rail. 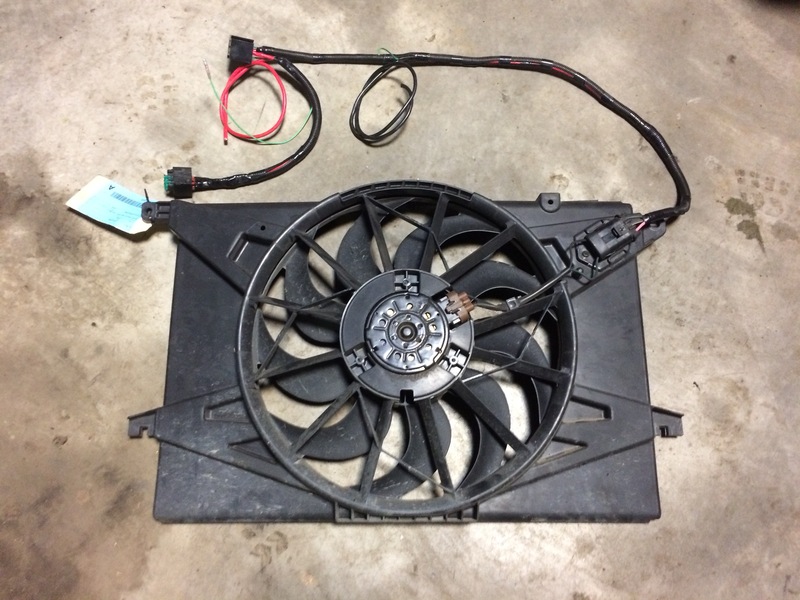 When it comes to fitting the fan, some trimming is required around the inlet/outlet of the radiator and the trans cooler fittings. The thermister needs to be removed (I just cut the ceramic coated coil off) and repositioned the plug so that it wouldn't interfere with the upper radiator hose. 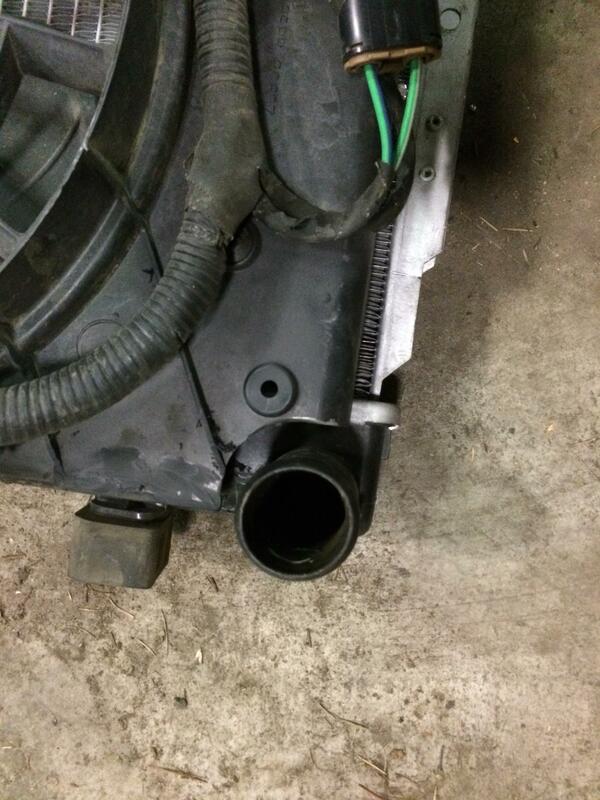 The factory ford mounting points also need to be cut off. This pic shows all necessary modifications and bolted to the radiator using the vacant mounting points on the plastic VS radiators using speednuts from supercheap. Fitted to the car and working as it should. This setup is a lot quieter than the mondeo's, and the BF fan is noticeably more effective. At approx 20 degrees C ambient temp, the BF fan pulls the temp from 92 down to 88 or so in only 22 seconds which is more than twice as fast as the previous setup. 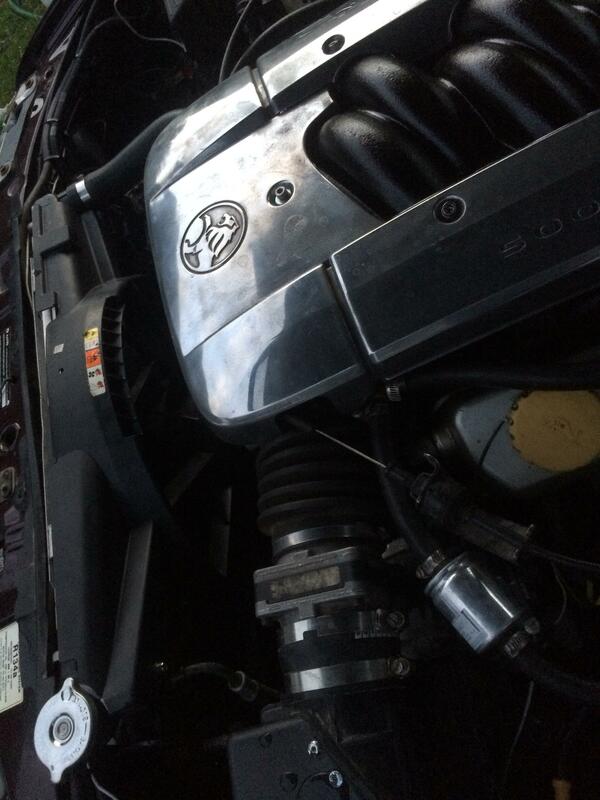 <<< After au fans/vs v8 series 3 radiator conversion in baby lc gtr was a headf*#k to do. 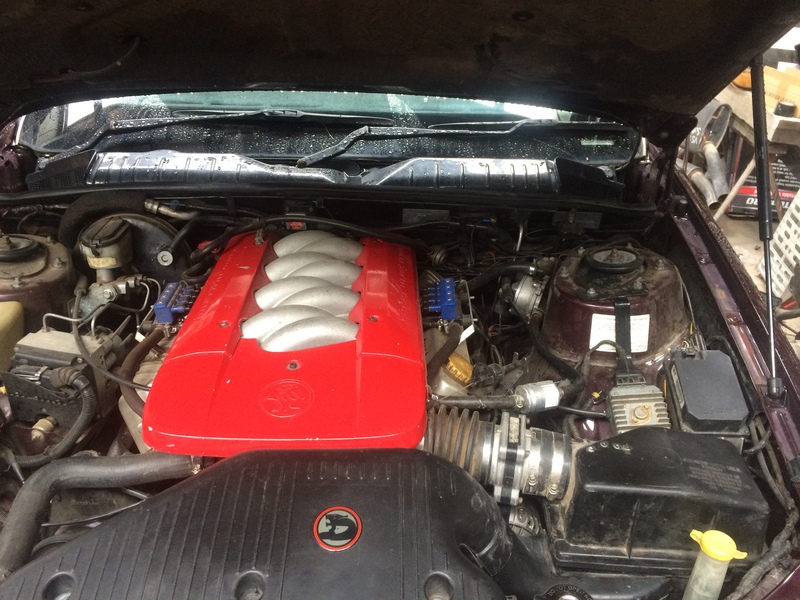 Current car(vh sle) have stuck with clutchfan/shroud..it works well + engine bay still messy...might do mondeo fans if find cheapies 'cos tiebar clearance. Read somewhere can get some relay or diode on a timer to fire up 2nd fan. Thanks mate, that's something else I wanted to add; IF you decide to skip the two speed setup and just have them running flat-out it's a great idea to use a time delay relay (just to delay the trigger to the second fan relay) if wired in parallel. Those thermos draw a MASSIVE amount of current on startup. The two speed setup negates the need for this as when the high speed is triggered the fans are already spinning at half speed so the initial current draw on the switch to high speed is less and for a shorter period of time. It's certainly important to factor in the capability of the electrical system (main wiring and alternator especially). Once they're spinning they don't draw much current at all (so I've read - I haven't tested this myself). Nice write up. BF/FG big single is a better option though. Can be found on eBay for bugger all and your getting a new fan rather then an old one with unknown life. Little bit of trimming but much better flow and a lot less current draw. Also means being able to just use the AC fan wiring with the temperatures changed in the tune. Saves having a rats nest of wires with lots of failure points. Never needed low and high speed was never that loud and never had any overheating issues. Good write up, maybe it should be moved to the How-to section or made a sticky in this section? I too prefer a large single fan but the Mondeo fans do fit well. So I've had the fans on since Friday and they've been working fine (triggering as they should etc), but I'm having cooling issues - just as I was with the clutch fan. On a 28-30 degree day it can't pull the temp down with the air-con going (but will maintain it, even in traffic), and without the aircon going the temperature takes a fair while to drop. It also warms up even at 80k's and the temp takes ages to drop - at least 5 minutes driving at 100kmph. Since it was having cooling issues before the new fan setup was installed, I figured the problem had to be elsewhere in the cooling system. I took the car to a radiator specialist (friend of a family member) and he was able to tell me straight away that the radiator is blocked. Feeling each corner of the radiator, the blockage is obvious. The corner near the filler neck was almost too hot to touch, and the corner diagonally opposite was barely even warm. I'll be getting the radiator cleaned out and the tanks replaced if it needs them this weekend, so will hopefully be able to report back with good results! I was very close to ordering a new one, but he assured me that my radiator will be good once he works his magic on it. And for less than $80 I thought it'd be worth having it pulled apart and cleaned. I was looking at one of the full alloy ones at around $330 for a decent one, but was told that it's overkill for what I'm doing here, so fingers crossed it works. If can do it for $80 & warrant the work give it a go. Ironically when had vt 5l cracked an end tank by air con guy then later on modded vy ss ute would crack end tank every 2-3 years wished had gone full alloy for ute. I ended up having the radiator reconditioned, replaced the water pump and sealed the thermo fans to the radiator with some high density foam I got from bunnings. It seems to run cool in all 38+ degree standstill traffic with the A/C on now too which is awesome. BUT I have come across another problem. With all the A/C, thermos running on high and headlights on the stock 85 amp alternator can't keep up. 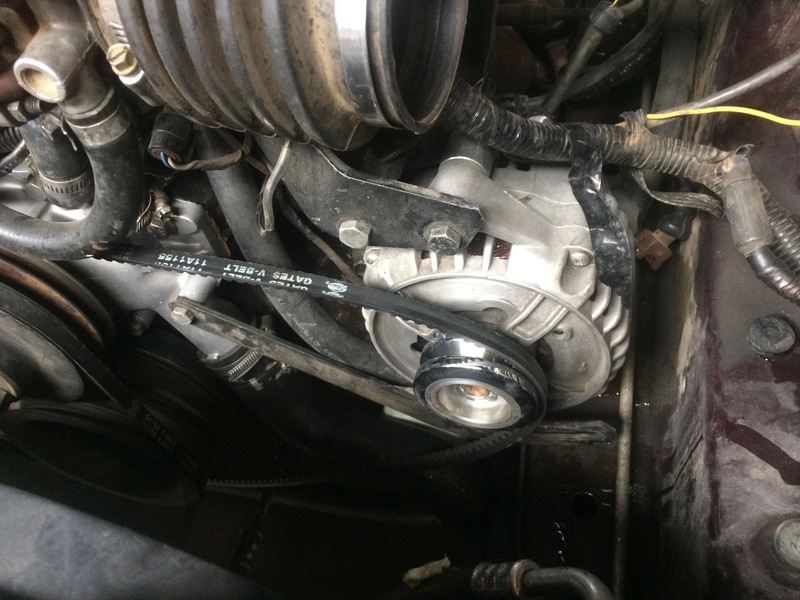 I've since purchased a VT 120A alternator to fit, and since the VT uses a serpentine belt and has a shorter alternator shaft, ill need to have a pulley machined to suit the VS. Hopefully I'll be able to get that done in the next couple of weeks. I'll try to remember to update this thread with more pics shortly. Also, the A/C currently triggers the LOW speed, but it needs to trigger the high speed. Otherwise the temp creeps up, the high speed pulls the temp down and the temp keeps cycling. I'm hopefully having the temps adjusted in the tune. 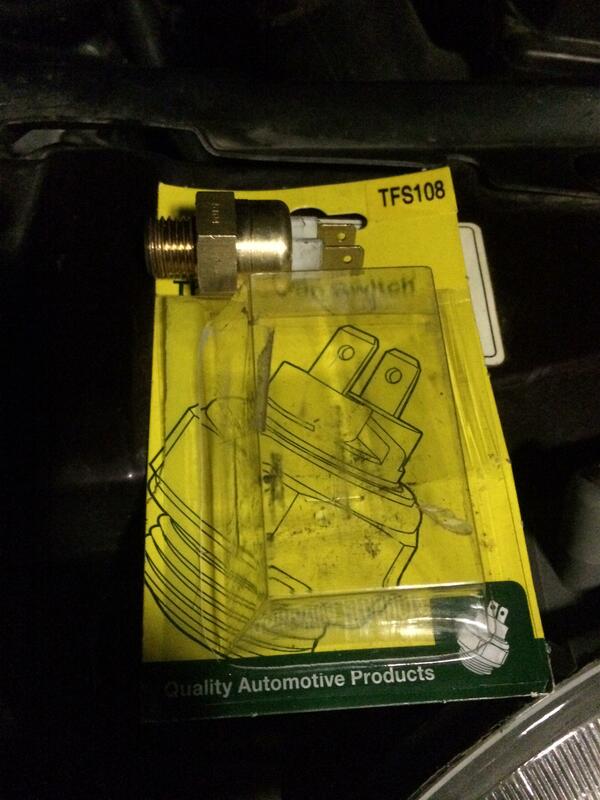 Which means that I'll have to buy another temp switch for the low speed but that's no big deal (around $30). Damn, more work lol. Gotta hand it to you mate, every problem I've come across with my 304 is something you've already dealt with and found a solution for. It's certainly made my life easier! Looks like I'll be modding the bracket. Do you remember what you had to do from memory? And did you find that the stock alternator couldn't keep up with the thermos too? I had none of these dramas running the FG big single just saying Mind you it was high speed only but wasn't ever loud enough to be an issue. I looked at those alternators and inquired about the output and they apparently only put out around 35a at idle which probably isn't any different to what I already have. 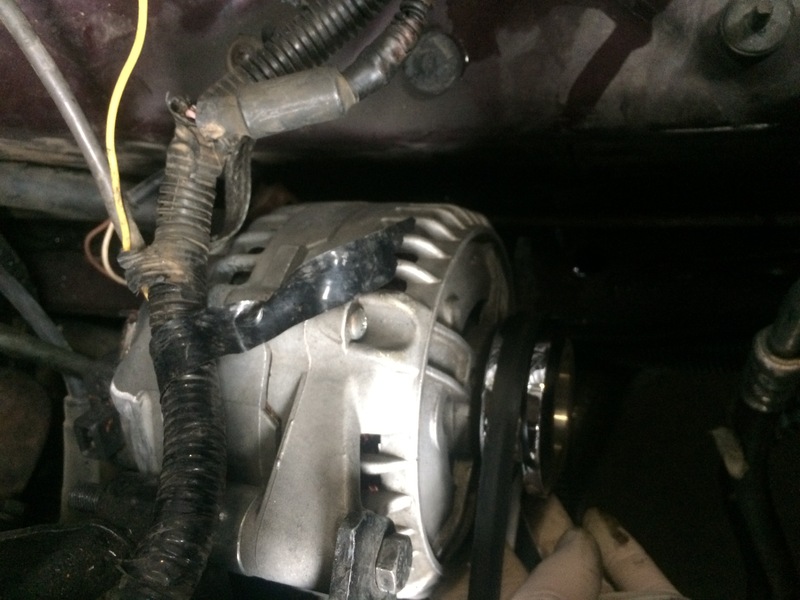 I've read that the factory bosh 120a alternators put out a lot more at idle than the after market ones, but haven't seen any solid proof of this. I'll pull it all apart again (maybe tomorrow) and try to get a better idea of what I need to do to get it to fit. I knew the alternator was fine as I tested it thoroughly through all different load scenarios because I didn't want to deal with an over heating car. See how you go though. I made a VT alternator fit on the VS. I took the alternator apart and rotated the rear housing to get the cable connection points at a better angle. 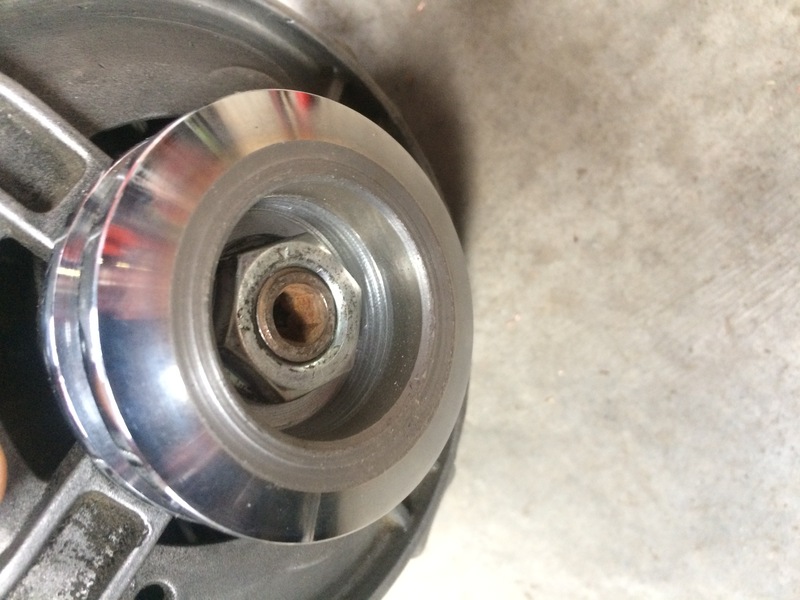 The VT alternator also has the 2nd mounting ear that you can cut off. Mine still has it on and it gets really close to the chassis rail but it's never touched. I stuffed around with the pulley's and some spacers I made up to make it all line up and work. 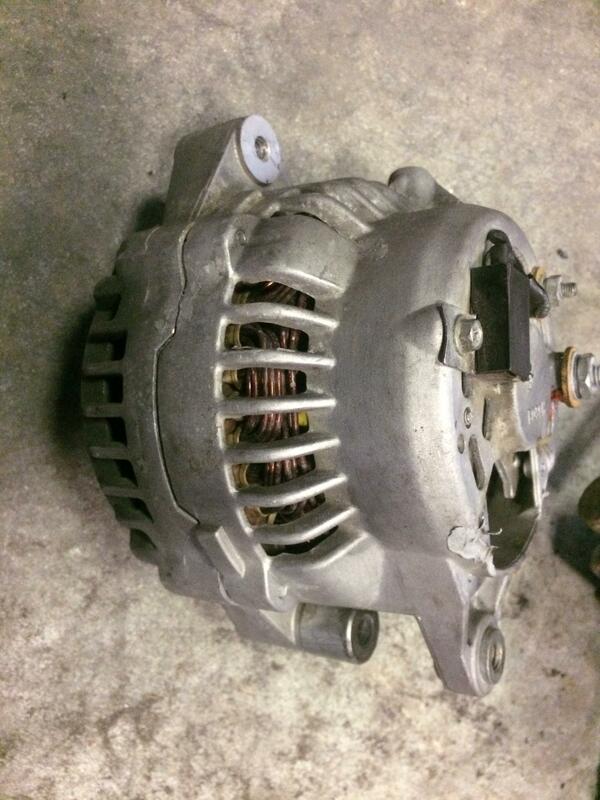 If you look on the body of the alternator it should tell you what the various outputs are. I think the standard 85amp alternator will have on it 35/85 14.4 which means 35amp low output, 85 amp high output rated at 14.4 volts.